Today our History page is about Yehudi Menuhin. I read a statement by him on his official website, and have reproduced it below. "Anything that one wants to do really and one loves doing, one must do every day. It should be as easy to the artist and as natural as flying is to a bird. And you can't imagine a bird saying, 'Well, I’m tired today. I’m not going to fly.'" First we have to really love playing. That does not mean that it comes naturally. You learn to love something, and sometimes it is hard. You keep at it until it just becomes second nature and when you set it aside or don't do it for a while you actually miss it. When we adopted our daughter, Adriana, I had not had a baby in the house since I was four years old. During the night she would wake up and cry. She would be wet. She would be hungry. She would be sick. I used to think that sometimes it would just amuse her to get her Mom and me out of bed. Was it easy to get up at 2:30 in the morning? NO! But we did it because we loved her. It's that way with practice. Is it easy? Usually not, but we play because it is second nature to us. Second, we need to practice regularly. Birds fly every day. If they don't fly, they don't eat. If they don't fly they don't drink. If they don't fly they're not safe from predators. If we don't play regularly we become susceptible to predators as well. Not the predators that will come and eat us up, but the predators of laziness and sloppiness due to neglect of our talent.
. . . or for love! 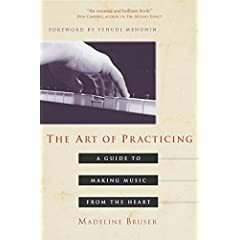 "Madeline Bruser has put together a valuable and insightful look at the art of practicing. If more people read this this book, perhaps we might see an increase in the number of inspired and joyful music makers who, rather than viewing practice as a punitive activity, regard it as the supreme opportunity to explore their own creativity." "An essential and brilliant book. Madeline Bruser gives us insight, wisdom, and tremendous practicality." "I've often thought of practice as playing--in the stretching, somersault, skipping, serenely special sense of the word--and The Art of Practicing reaffirms that. It gently and joyfully reminds us of the beautiful reasons we love music and become musicians in the first place." An outstanding book on music and practice for student musicians, amateurs and professionals alike. Forward written by violinist Yehudi Menuhin. 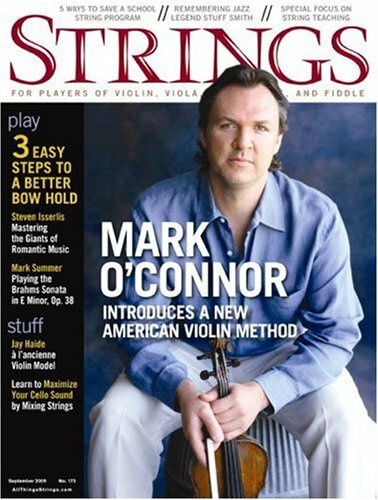 is an excellent resource for intermediate to advanced players of all bowed instruments! 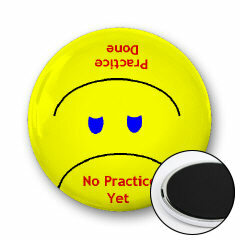 Place this fellow on your fridge so that his frowning face reminds you that you haven't practiced yet today. Once you've practiced twist him around (place mouse over picture) and his frown turns into a "Practice Done" smile! 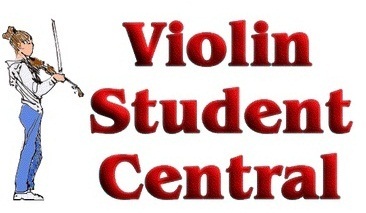 Loving the violin can be hard, but you can learn. And practice your violin regularly.